The 8th Robot Survival Game took place at HOBBY ROBOT COLOSSEO, the biggest hobby robot event in Japan which took place at Shizuoka Convention & Arts Center "GRANSHIP" in Shizuoka City on Sep. 3-4, 2011 during the 50th Japan SF Convention. 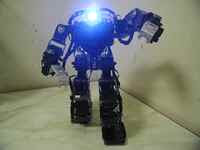 Robot Survival Games such as Extermination Battle, Flag Battle, Fortress Battle and Rumble Battle were carried out. Robot Survival Game was planned by Tanaka-san and Bishii-san. 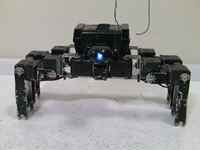 Mobile, not only multi-legged robot or biped robot but also mobile with wheel or caterpillar, which equipped with toy gun, hit sensor and camera system, can join to play survival game. 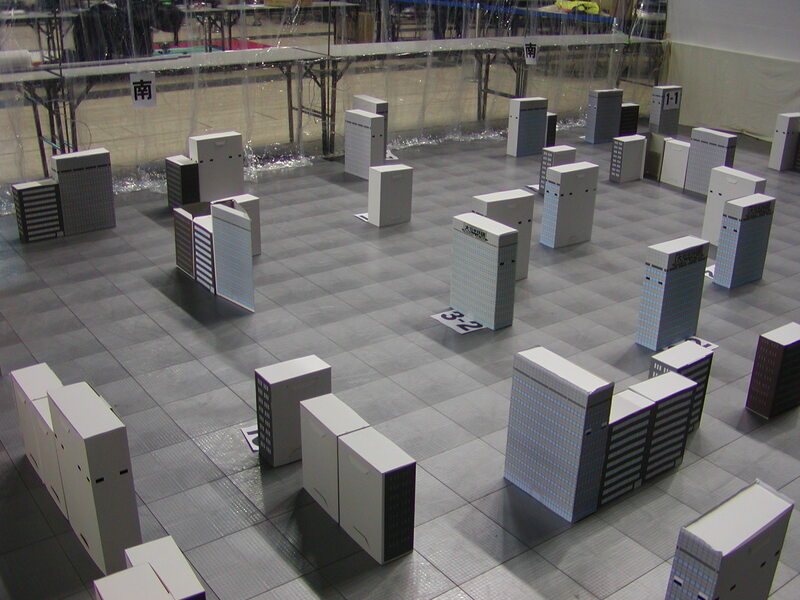 The 1st Robot Survival Game took place at Akihabara, Tokyo on July 19, 2010 and the game takes place every 2 months. Tanaka-san also planned several kind of survival game, such as Extermination Battle, Flag Battle and Fortress Battle. Ten Robot joined the 8th Survival Game were divided into two teams, Igga-san Team and gons-san Team. Igaa-san Team members were Saaga(Igaa), Yabusame(mota), Σshiguma(Shimaken), Pantsure-Kanikan(Kamiya) and GonbeiMk-Ⅱ(B-saku). Gons-san Team members were Denryu(gons), Butank-kai(Osaru), Little Cat(Chiba), Stallone(Noborizaka) and Benkei(Michii & Ookuma). All robot were controlled by camera system in all battles except for Rumble Battle. Extermination Battle and Flag Battle took place at 16:00-16:45 on Sep. 3rd. Each team fights to destroy the enemy completely within 5 minutes; Winner team is having larger number of survival robot after 5 minutes. Each team builds fortress and set a flag in each territory. Each team fights to shoot down flag in the enemy territory. The winner is the team shot down the enemy flag within 5 minutes or the team which has larger number of survival robot after 5 minutes in the case of each flag does not shoot down within 3 minutes. Fortress Battle and Rumble Battle took place at 11:00-11:45 on Sep. 4th Chiba-san took videos from the 2nd floor of Survival Game Field. One team is just offensive and other team is just defensive. Just defensive team builds fortress and set a flag in it, and offensive team attacks the fortress and shoot down the flag. Attack team does not know enemy fortress structure. All robots fight each other and just one robot survival is winner. Rumble fight was carried out without using camera system. The winner was Butank, custom-built by Osaru-kun. Just 2 robots fight in the field. Using of full field and fighting time was 5 minutes. Noborizaka-san also uploaded videos of the 8th Robot Survival Game in his channel. 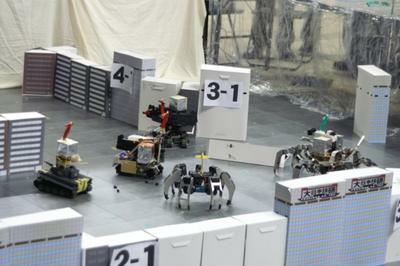 Trials of the Robot Survival Game were held twice on April 10th and June 13th (1) (2), 2010. The 1st Robot Survival Game took place on July 19th, the 2nd one on Sep 11th, the 3rd one on Nov 20-21st, the 4th one on Dec 11 in 2010, the 5th one on Feb 20, the 6th one on April 17 , the 7th one on June 26 in 2011 and the details were described in this blog. The continued development of the robot survival game will bring new members into the discipline with tracked robots, multi-leg, biped, improving the whole thing! The very idea of seeing all this is AWESOME !!!! !